The Manfrotto Pro Light Reloader Tough H-55 and Tough L-55 cases are designed for professional travelling photographers and videographers. The Pro Light Reloader Tough H-55 retails for £289.95 and the Pro Light Reloader Tough L-55 for £289.95. Manfrotto, world leader in the photography, imaging equipment and accessories industry, is pleased to announce new additions to the Pro Light Reloader range – the Tough H-55 and Tough L-55. Designed for professional travelling photographers and videographers, the Reloader Tough 55 cases offer unparelled protection of photographic gear thanks to the Manfrotto Protection System – allowing peace of mind when traveling on assignments. This robust and solid case is made in Italy using heavy-duty materials. It is based on lightweight and military standards and features original Manfrotto styling. The safe-release system latches located on the main access make the Tough H-55 secure. No compromises are needed: high safety and portability are equally guaranteed by the Pro Light Reloader Tough H-55. The Pro Light Reloader Tough High Hood is compliant with international carry-on dimensions and features a 2-stage retractable trolley system. The case securely protects a pro DSLR with a 400mm lens attached, a second DSLR and 3-4 additional lenses. All internal dividers are customisable: they can be moved at any time within the roller case, according to the shape of the gear to be carried. The external front tripod attachment holds a large-sized tripod by means of metal retaining pins. The internal camera protection system unit can also be effortlessly removed. In addition, two handles are located on the top and side of the roller case. In any weather conditions and whatever the destination, the Pro Light Reloader Tough high-hood roller case protects costly imaging gear from water and dust. The Pro Light Reloader Tough H-55 high-hood complies with international airline restrictions regarding carry-on luggage dimensions (55 x 35 x 22.5cm). RRP £289.95. Similar to the Tough H-55, the Tough L-55 is based on lightweight and military standards and made in Italy with heavy-duty materials. The safe-release system latches located on the main access are what make it so secure, and high safety and portability are equally guaranteed by the Pro Light Reloader Tough L-55. Compliant with international carry-on dimensions and featuring a 2-stage retractable trolley system, the case securely protects a pro DSLR with a 70/200mm lens attached, a second DSLR and 4-5 additional lenses. The internal dividers are customisable and can be adjusted to suit the gear that is being carried at the time. The internal camera protection system unit can be fully removed, and a large tripod can be carried using the external front tripod attachment. 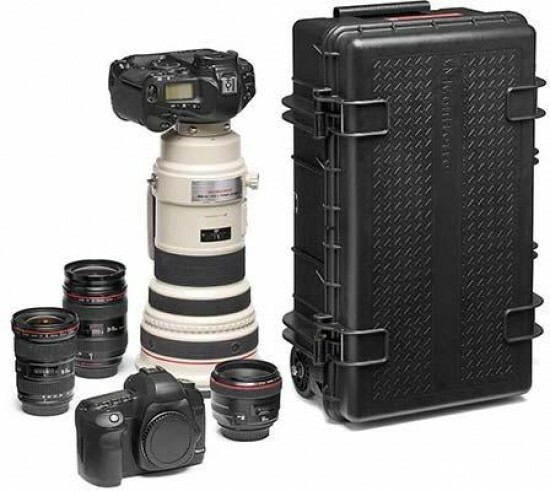 The Pro Light Reloader Tough Low Hood roller case makes sure your imaging gear is protected in any weather conditions at any destination, and also incorporates two handles on the top and side of the case. The Pro Light Reloader Tough L-55 low hood meets the most stringent airline restrictions regarding carry-on luggage dimensions (55 x 35 x 20cm). RRP £269.95.